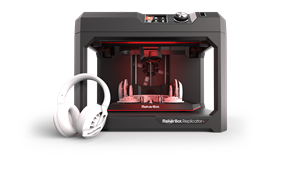 MakerBot Replicator+ combines unparalleled performance with superior results and lasting reliability. Features include an LCD display, an on-board camera, as well as USB, Wi-Fi, and Ethernet connectivity. On-board camera remotely monitors your print progress with the MakerBot Print and MakerBot Mobile apps. Print/Creation Size 6.50" x 7.68" x 11.61"
To ensure improved performance, the Replicator+ features a sturdier construction, a 25% bigger build volume, better print adhesion, and more. The Smart Extruder+ and all ease-of-use features from the previous model come standard. The Replicator+ is also compatible with MakerBot’s new Slate Gray Tough PLA Filament Bundle, created for engineers and designers. With the new Grip Surface, prints adhere better, resulting in reduced warping and curling. Prints are also easier to remove with the new bendable Flex Build Plate. 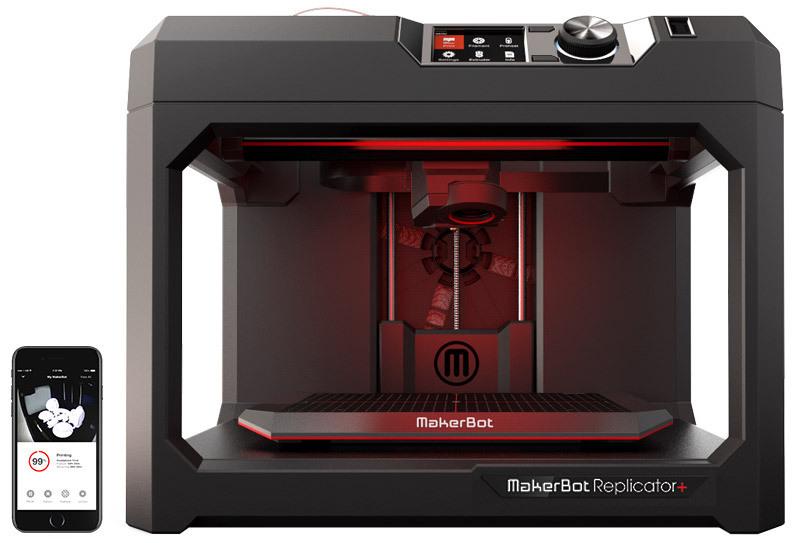 The built plate is also factory-leveled so your Replicator+ is ready to go right out of the box. Our new slicer algorithm automatically adjusts slice settings for your specific printer model, software version, and Smart Extruder type. The new print preview helps verify design details before printing. Plus, our redesigned rafts and supports break away more easily for a cleaner print surface. Made with designers and engineers in mind, the MakerBot Slate Gray Tough PLA Filament Bundle allows you to create durable, high-impact strength prototypes and fixtures.